Update: As of 2:40 EDT all of Michael Park’s reviews are taken down so you will have to take my word for their value. As you know I have been exploring a Google review spam network. Google took down everyone that I pointed out to them in the network but neglected to dig one iota deeper and find the many related profiles. Their loss. My gain was finding Michael Park, legal reviewer extraordinaire! Either he is a spammer or the most prolific plaintiff in the 50 states. And when I say 50 states, I mean each and every one of them. Ok…. not every one of them, but quite a few. Michael, you see has left 23 lawyer reviews, in the past 7 months in at least 22 states. Either he has an obsessive compulsive desire to sit in lawyer offices and courtrooms or maybe, just maybe he is a review spammer1. Richard is an experienced attorney who was very attentive and detailed to my case. I would highly recommend him to friends and family alike. MCK are truly experienced attorney’s and were very attentive and detailed to my case. I would highly recommend them to friends and family alike. Streetfight: Frustration With Digital Marketing Vendors Boils Over for One SMB. In my biweekly conversation with David Mihm, we discussed the how the hard sell in the local world was leading to bad outcomes for all of us. LocalU: Video Deep Dive Special Edition: Darren Shaw & the Local Search Ranking Factors Study. Darren Shaw of Whitespark joins me to discuss the methodology, results and future of the Local Search Ranking Factors Study. Mozcon: Are Words the New Links?. Moz is now selling the video of the day long MozCon Local event in February. As teaser for the bundle they are providing my presentation gratis. LocalU: And Video: Last Week in Local April 17th, 2017. My weekly video with Mary Bowling that is also available as both a weekly e-mail newsletter and a podcast. Google is now displaying a Product/Page Link in the Knowledge Panel and providing direct entry of the link via the Google My Business dashboard. Last week Google added the ability for individual restaurants to add their menu links to the GMB dashboard and have them show in their branded KP result. At the time it appeared to support service menus as well but it was buggy1 and the feature was temporarily pulled. The feature is back and appears to be now fully functional. The Google Knowledge Panel has largely become a business’s new home page. By that I mean that the bulk of consumer to business interactions are now occurring ON Google and not on their home page. In Barbara’s case at a ratio of 3 to 1. She gets three times the number of calls and driving directions from Google than she gets from her website. In having looked at a large number of businesses over the past several months, I believe this to be generally true of most businesses. Given that, the ability to add a link directly to the Knowledge Panel, creates one more focused opportunity for a business to interact with a customer when they do click through from the Knowledge Panel. While many interactions are taking place on Google, the bulk of the remaining direct client interactions are taking place on her website via traffic referred by Google. That makes your product service page one that could get increased views and increased opportunities for client interactions and conversions. 1 – As a note, the feature is still a little wonky, When you first add the service menu link, it is displayed with the link in red and crossed out. However if you refresh the screen that goes away. I don’t often express pride publicly but one thing I am very proud of is LocalU. Over the years this group of talented Local SEO’s has led the industry in educating and training small businesses and agencies in ethical, sustainable and leading edge Local SEO. 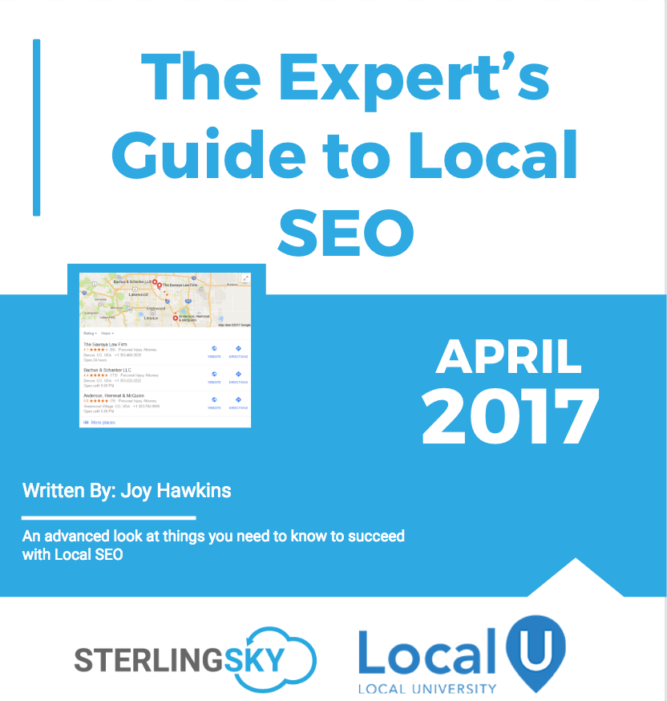 One such effort is Joy Hawkin’s new training manual, The Expert’s Guide to Local SEO. Just like the human brain, Local SEO has two sides: the creative and the technical. When we clarify a local business’ marketing vision, craft content, help draft owner responses and seek new ways to earn reviews, we’re in right-side creative mode. When we hunt for duplicate listings, need to see all the categories a competitor is using, or manage a NAP overhaul when a client moves to a new location, Local SEOs move to the left side of brain – the technical side. It’s within the latter – the technical hemisphere – that The Expert’s Guide To Local SEO stands as an unprecedented resource for managing the most challenging and sparsely-documented daily tasks agencies and businesses face. How do you unverify a listing? Do listings marked closed really hurt open businesses? What is the difference between a soft and a hard GMB suspension and what can you do about them? Google has never done an adequate job explaining the technical details of how to work with its powerful local product – in fact, the meagerness of their documentation is legendary. And this is precisely why agencies and enterprises will feel a kind of light-headed, amazed empowerment opening the pages of this guide, which is the joint effort of Joy Hawkins and LocalU – recognized industry experts. Here are all of the technical procedures you need, all in one place, to answer nearly every question that surfaces about the in-the-trenches procedures for building and maintaining a healthy local, digital presence. Your team could spend 20 minutes trying to find an article that describes how to contact Google’s various support platforms, or you could just open this guide. You could try to figure out on your own how to find a listing CID number (good luck! ), or you could just open this guide and follow the clearly documented, well-illustrated instructions. For the relative beginner in the field, you’ll also find sound pointers on the basics of local-focused website design, understanding Yelp’s filter, and why citations matter. But the greatest strength of this landmark eBook is in the time it will save all readers dealing with the nitty-gritty of daily dealings with Google My Business and the various local data formats. In this regard, The Expert’s Guide to Local SEO stands alone as the most comprehensive eBook on the market, almost guaranteed to to up the game of even very advanced practitioners. The chief hurdle to writing Local SEO book of lasting value lies in the fact that the pace of change in our industry is dizzying. Guidelines change, major updates happen, practices that once moved the needle just don’t anymore. If you publish a static manual on the topic of Local SEO, parts of it are almost guaranteed to become outdated within a couple of years – if only because Google keeps rebranding its local product! Fortunately, the experts behind The Expert’s Guide to Local SEO have foreseen this reality, and it’s a tremendous and necessary value-add that purchasing the book comes with an offer to subscribe at a reasonable price to future updates. It’s an opportunity to learn from Hawkins and team not just once, but continuously. I’ve been working in the Local space for over a decade now, and in that time, I’ve seen a few extremely bright people arrive on the industry scene and really light it up. David Mihm is one, with his vision of the need for automated local business data management. Phil Rozek, with his creative thinking and exceptional communication style, is another. Joy Hawkins joins these enlightened ranks with the publication of The Expert’s Guide to Local SEO. For the past few years, industry insiders have been repeatedly wowed by her ability to root out and solve the most abstruse technical problems and I have personally learned so much from her highly-specialized expertise. It’s my hope, that with this partnership with LocalU and with the publication of this guide, marketers at every level of experience are about to start learning from Hawkins in a way that will make a truly meaningful difference in their skill set and in the quality of service they offer to clients. — Miriam Ellis is the Local SEO Subject Matter Expert at Moz and runs her own Local Search Marketing Agency, Solas Web Design. Yesterday, bulk users received the ability to download 18 months worth of data across all of their listings. Today it appears that all accounts, whether bulk or not, have the same capability. This means that individual businesses will now be able to go back 18 months in their data analysis AND it means that agencies will now be able to retrieve meaningful data for all of the individual clients in their dashboard. This will allow agencies the ability to track information for longer periods and to do more month over month comparisons. This will allow for better trend spotting. With a little Excel macro magic, it might even allow for complete automation of their monthly reporting of this data to their clients. Now if we could just get the CSV sent automatically. There are two recent Google My Business Insights roll outs that are happening that should benefit bulk listings and those businesses with higher levels of foot traffic. Evan Older reports on G+ that Google is now shipping the ability to download aggregate data in a spreadsheet form on all of your listings. I knew that this product was in beta and the fact that Evan is seeing it likely means that it is rolling out more widely. It has not yet been included in the GMB new features page So it might be a while before you find it in your bulk dashboard. Update: As a note this download is now also available via the card view of the dashboard so if you are an agency and have management access to all of your client’s listing you can download the information in bulk into a spreadsheet and then, using macros, assign it to each client. It can go back 18 months. This is apparently being rolled out now in stages and shows both frequency of return visits and moved the popular times information from the Knowledge Panel into the GMB dashboard for any given listing. These data points do not yet appear to be available in the bulk upload. I am curious how many of you see either or both of these new reports and the bulk download? The Largest Review Spam Network Ever Or… Who is Shazedur Rahman and why should you care? The title, The Largest Review Spam Network Ever, might seem like hyperbole. While I don’t yet know the network’s full size, it is responsible for tens if not hundreds of thousands of fake reviews. If you are interested in stories with happy endings, you would be better off reading some other post0. Who is Shazedur Rahman and why should you care? Apparently she is a world traveler that purchased her wedding ring in Israel and eight months later hired a PI to track her husband down in Cebu1. She had her cell phone fixed by the same franchise in both Toronto & Vancouver2 and procured Pest Control services in both NYC and San Antonio. While in Austin she had her children’s teeth examined but prior to doing so checked out four other dentists before she chose Dr. Melanson. Shazedur has had her cars shipped from Seattle to Kansas City, Portland to NYC and from Simi Valley Ca to someplace. Oh and for some reason she doesn’t like3 the cigars from Sam’s Smokes in Brisbane, Australia. Did I mention that she studied mortuary science in Wheeling Il. All of this and more has occurred within the last year. Truly a renaissance woman. This is a screen shot of Shazedur Rahman’s reviews around the world. Click it to view them all. OK. I confess. She’s a review spammer. But you already figured that out. What you haven’t figured out is that she sits amidst one of the largest review spam networks I have seen and I have been unable, due to its size, to get anywhere near the end of it. Worse, I have been unable to get it removed from Google. When you start cross checking her reviews against other reviewers you find a similar pattern of reviews over large geographic areas5, for businesses that often have spammy names6, they are frequently in the service industries rife with spam7, the reviewers often review similar types of services in disparate locations8, and the reviews contain conflicting life stories and obviously fake identities9. And there is always an overlapping of businesses that they review in common with the other reviewers. Usually any reviewer has no more than 3 reviews in common with any one of their compatriots. While the pattern is obvious it is apparently too subtle for Google’s algos or human reviewer to spot. Click to view and contribute to the spreadsheet. I have no idea how expansive this network is but in the hours I have studied it, I have found at the very minimum a hundred reviewers and many more businesses10. Google recently released and touted their research on fake listings in Google Maps. While their may have been a few problems with the research and quibbling about the details, I wanted authoritative voices as to its worth. I reached out to the living past and soon to be past presidents1 and asked2 them. “It depends on your definition of fake, but I found the research very interesting”. “The research was very, very special and very, very nice. We have some bad hombres here and with my help Google’s gonna get ’em out”. “Intelligence gathered by this and other Google research leaves no doubt that the fake listings possessed and concealed some of the most awful spam ever devised. Google has been been very candid about their past. They found the weapons causing this abuse and destroyed them”. “Read my lips, if Google says no new spam, it means no new spam”. “I’ve looked on a lot of spam with lust. I’ve created fake listings in my heart many times. I am glad it was just in my heart or Google would have suspended me. Or maybe not since I was a lawyer”. “During my administration, Google signed into effect the biggest fake listing cut in history”. 1 – Who knew that Bush One was still alive? I had to do this search Is Is George Bush 1 still alive and verified that he was by reading Wikipedia. There is a even a Snopes article on the topic George H.W. Bush Death Hoax and a piece in the Onion: Bush Dies Peacefully In His Sleep covering his demise. 2 – OK I didn’t really. But if you are going to be in the fake news business I figure go big or stay at home. I always thought that it was the famous propagandist Goebbels who noted “the bigger the lie the better” but apparently that was not the case. It has been falsely attributed to him. This fake stuff is hard to keep track of. There is a certain “meta-ness” to discovering that a quote by the most famous fake news master is fake while researching and writing a fake news article about a fake story on fake listings.